Chief Hatfield grew-up in Castalia, Ohio, a small community located east of Oak Harbor in Erie County. In 1988 he joined the United States Air Force and was assigned to Edwards Air Force Base as a Police Officer. In 1993 he relocated to Carroll Township. After moving he joined the Carroll Township Fire Department. Chief Hatfield decided to return to school and attended Terra Community College. In 1996 he was hired as a full-time patrolman for Carroll Township and he maintained this position until being promoted to Sergeant in 2003. During this time he learned how the daily operations of a police department were handled. In 2005 he was given the responsibility of Interim Chief. 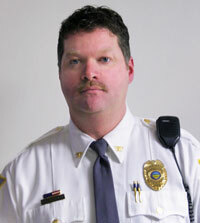 Chief Hatfield accepted the permanent position of Chief of Police in December of 2005. During the Chief's off time you can find him enjoying our area of Lake Erie, as he is a Licensed Charter Captain and an avid outdoorsman.